Severe, repetitive cycles of drought have the potential to cause "catastrophic regime change" in ecosystems, making it unlikely that many species will manage to recover. That's the conclusion of a new eight-year study published recently in the journal Freshwater Biology by researchers at Oregon State University. "Populations that have persisted for hundreds or thousands of years are now dying out," said David Lytle, an associate professor of zoology, and chief author of the study. "Springs that used to be permanent are drying up. Streams that used to be perennial are now intermittent. And species that used to rise and fall in their populations are now disappearing." The scientists focused their research on an aquatic desert ecosystem in Arizona, in the United States, and discovered that the formerly perennial stream dried up completely during a series of droughts in the first decade of the present century. The droughts caused a rapid shift that resulted in the local extinction of several species, including some top predators among the ecosystem's former insect population. "Before 2004, this area was like a beautiful oasis, with lots of vegetation, birds and rare species," Lytle said. "The spring has lost a number of key insect species, has a lot less water, and now has very different characteristics." Although the long-term study focused on one isolated stream and its ecosystem, Lytle notes that the process is happening all across the desert Southwest. "Eventually this could lead to the loss of species from the entire region, or the complete extinction of species that rely on these desert oases," said co-author and doctoral candidate Michael Bogan. 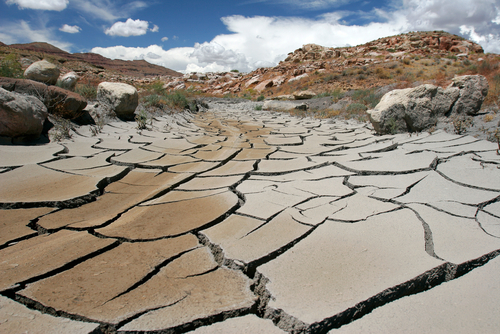 In the past 30 years the area has experienced increasingly frequent - and severe - droughts. The drought that completely dried up the stream under study caused the lowest flow in streams throughout Arizona in the past 60 years. The drought that killed invertebrates in the study stream was probably an unprecedented occurrence, said researchers. Unfortunately, climate change models predict that such droughts will not only continue in the desert Southwest in the foreseeable future, but they will come more frequently and they will be more intense.